This package will start one hour before the wedding ceremony either church or civil ceremony, with one video camera at the brides house capturing all the final preparations for the day and one camera filming at the church or venue capturing the arrival of the groom, attendants, guests, the bridesmaids and brides mother and finally the arrival of the bride.We will continue to film throughout the service with one camera at the front and one camera at the rear, the signing of the register and your walk back down the aisle.Two video camera coverage at all times, will capture the photocall and guests reactions. 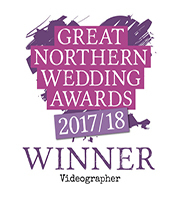 Once at the reception venue we will endeavour to capture all the emotion of the day following you throughout.The second camera meanwhile will follow your guests ensuring we capture all the little moments that you miss. Filming finishes once you are seated for your meal.